With the help of your generous and loving support, life in Tchemulane has transformed. Children and families are much stronger now. The community has met its goals, and its members are working together to tackles new ones. Your support will have a lasting impact for years to come. The Tchemulane community is located about 300 km north of Maputo, Mozambique's capital city. In the local language, the name Tchemulane means “Let's work." The people in this area have experienced great trauma. They endured 16 years of civil war, during which time most had to flee to neighbouring cities for refuge. After fighting ended in 1992, the community began to recover, but progress halted when massive floods hit in January and February 2000. The floods destroyed the area's farms and the livelihoods of more than 70% of residents. Almost all families depend on agriculture for food and income, and the majority do not have enough food to last year-round. Many mothers struggle to support families on their own. Men in the area often migrate to work in the South African gold mines or in the capital city, returning home every 12 to 18 months. Some mothers are widows due to the impacts of HIV & AIDS and the civil war. Children, especial girls, are a key source of help at home. This jeopardizes their chance at an education, however, and their opportunities for the future. Thanks to the generosity of Canadian sponsors like you, life in Tchemulane has improved. Your support will have a lasting impact for years to come. Let’s celebrate these accomplishments! 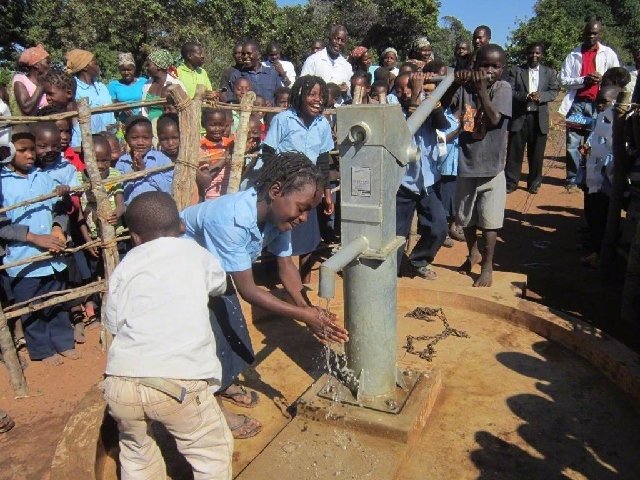 32 new wells are providing safe water. Now families—especially children—don’t walk as far to fetch water and illnesses like diarrhea have been reduced. Literacy has improved, and school dropout rates have gone down thanks to new school infrastructure. Health services have been bolstered and waterborne diseases have been reduced. Farmers are working together, expanding their operations and able to provide for their families. 120 savings groups involving 3,000 people are helping parents pay for children’s education and medical needs. 6 farmers’ groups have been mentored to move from subsistence agriculture to commercial farming. Solar electricity was installed in the health centre, making it possible to sterilize equipment and preserve vaccines. 10 health committees are teaching families about nutrition and healthy behaviours. 15 classrooms, 6 administrative buildings and a new high school library were built, along with 525 desks. Teachers received training in more effective methods, and schools received updated curriculum.